Our apartment initiated a Go Green campaign few weeks back, with posters all over the apartment complex, starting from the entrance gate to the lift. The poster clearly depicting the three colored waste collection bins, samples of recyclable waste etc. Our apartment has mandated us to have separate bins at home, one for recyclable wastes and another for compost-able waste. One going into white trash bags and another into black, so they can accordingly dispose them into the main waste bins. We have been talking the importance of recycling, saving energy and such likes at home, in addition to my daughter’s school formally introducing the concept. 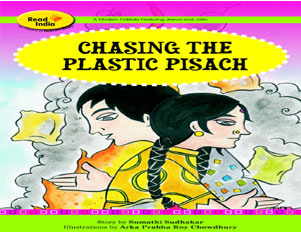 This book came handy to dive in a little deeper into the “Why’s?” The usage of story as the medium to convey the point, along with characters like panchrangi the parrot, plastic as “pisach” aka monster just adds to the delight of story telling to these tiny tots. My daughter made my day, when a new maid had started work and she instructed her to throw the milk covers into the white trash bin. Because they won’t decompose and if they end up burning, they will produce harmful gases that are bad for health. She now wants to save all the plastic into her “project box” and recycle them into a pencil box @ home!!! Shudder! This also means I will soon have to find some place (more likely a video ) where the kids can see this in action. Will update this post when that happens. More details on this and few other books in their environment series here.